Raissa — A Silent Yet Brillant Soul.. | Tell Me… Am I From This World? Raissa — A Silent Yet Brillant Soul..
Raissa Edsel Camille Marcial Gerones — whew!! What a name!! Her parents might have been too happy that she came into their lives that they gave her the best names they could think of.. Hehehe..
Well, any parents would be too lucky to have such wonderful and smart young lady as their first born, wouldn’t they? This lady with a very long name is fondly called Rai, by her friends, or Camille, for those who are more than friends.. Hahaha!! But definitely, this girl is one hell-of-a-head-turner.. She probably doesn’t know or hardly aware of it, but her simple beauty captures a lot of those guys’ eyes.. Well, now she knows!!! We also love to call her Madame, because she seldom speaks but once she gave her opinion, everybody listens.. Maybe because, though she isn’t the oldest, she acts as the ‘big sister’ of the group.. She is the most rational among us, I guess.. Hehehe..
She is also our jack-of-all-trades.. Our financier if we got short of money, buys the food we ordered yet decided not to eat, or goods that we didn’t like in the end.. A certified bookworm as well, she exhibits a complete woman who has vast knowledge on almost everything..
Well, for us, she is just Rai — a silent girl who sits beside Hazel on a place we call Bermuda.. Hehehe.. Because most of the time, one of them just suddenly disappears without the other being aware of.. Rai who always try to understand us and always keeps her cool no matter how bad the situation is.. I never saw her lose her temper since the day I met her..
Now is your day girl.. Keep that cool and enjoy!! 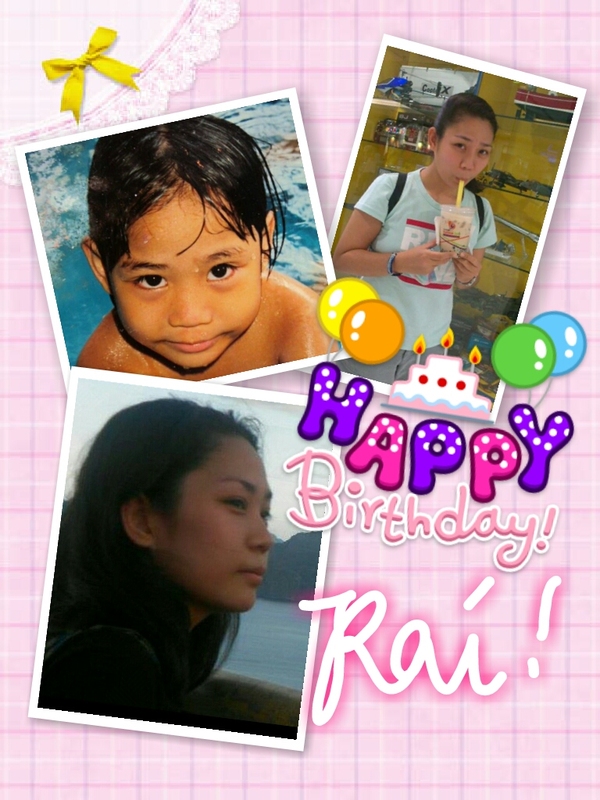 Happy Birthday Rai!! Love yah girl! !